Researchers used gravitational perturbation theory and believe that they have discovered a previously unseen planet orbiting a distant star. A perturbation theory is a mathematical method that is used to find a solution to a problem that cannot be solved exactly. This is first done by using the solution of a related problem. Isaac Newton used his formulated laws of gravity and motions to the first analysis of perturbations. Astronomy utilizes gravitational perturbation theory in studying motions of massive objects that are subject to forces other than the attracting gravity of another single object. These forces may be the gravity of a third or more object, resistance, and the off-center attraction of an oblate or otherwise misshapen body. Combining data from the Kepler spacecraft and complex mathematical equations, researchers may have discovered a new unseen planet. The Kepler spacecraft is a space observatory of NASA with a mission to discover habitable planets in other galaxies. More than a 150 years ago, before Neptune was ever sighted in the night sky, French mathematician Urbain Le Verrier predicted the planet's existence based on small deviations in the motion of Uranus. In a paper published today in the journal Science online, a group of researchers led by Dr. David Nesvorny of Southwest Research Institute has inferred another unseen planet, this time orbiting a distant star, marking the first success of this technique outside the solar system. Using a laborious computational method to assess the effects of gravity, known as gravitational perturbation theory, Le Verrier argued in favor of Neptune's existence and predicted the position of this hidden world to within an arc degree, as later detected directly by Johann Galle of the Berlin Observatory. "Today's telescopes are detecting planets around distant stars, and NASA's Kepler Telescope, launched in 2009, is a champion among them," says Nesvorny. It finds planets by continuously monitoring the brightness of more than 150,000 stars, searching for brief periods of time, known as transits, when a star appears fainter because it is obscured by a planet passing in the foreground. But there's a twist. "For a planet following a strictly Keplerian orbit around its host star, the spacing, timing and other properties of the observed transit light curve should be unchanging in time," said Dr. David Kipping of the Harvard-Smithsonian Center for Astrophysics and second author of the paper. "Several effects, however, can produce deviations from the Keplerian case so that the spacing of the transits is not strictly periodic." A hidden planet, for example, can distort the sequence of transits if it gravitationally pulls on the transiting planet and delays some transits relative to others. 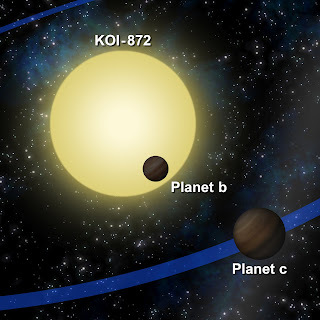 Scientists analyzed Kepler Telescope data and identified KOI-872 as a stellar system where measured transits of a planet orbiting the star show large time variations (the shifting bumps in the data) indicative of a hidden companion. A team led by Southwest Research Institute and the Harvard-Smithsonian Center for Astrophysics determined that the observed variations can be best explained by an unseen planet about the mass of Saturn orbiting the host star every 57 days. As part of the Hunt for the Exomoons with Kepler (HEK) project, the team analyzed recently released Kepler data and identified systems with transiting planets that show transit variations indicative of hidden companions, such as unseen moons or planets. The team identified the Sun-like star known as KOI-872 (KOI stands for Kepler Objects of Interest) as exceptional in that it shows transits with remarkable time variations over two hours. "It quickly became apparent to us that a large hidden object must be pulling on the transiting planet," says Nesvorny. "To put this in context, if a bullet train arrives in a station two hours late, there must be a very good reason for that. The trick was to find what it is." Using Le Verrier's perturbation theory to speed up time-consuming computer calculations of many possible configurations of planetary orbits, the HEK team showed that the observed variations can be best explained by an unseen planet about the mass of Saturn that orbits the host star every 57 days. According to the analysis, the planetary orbits are very nearly coplanar and circular, reminiscent of the orderly arrangement of orbits in our solar system. 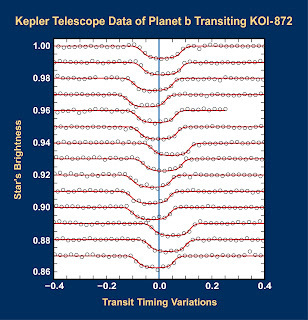 The team's claim will be put to the test by Kepler's new observations, which will track dozens of new transits of KOI-872, comparing their timing to published predictions. "Whilst the principal goal of the HEK project will continue to focus on searching for moons, this first planetary system discovered by HEK demonstrates the unexpected discoveries possible with transit analysis," said Kipping.